The estimated capital cost of the first phase isUS $489m. Phase two will cost about US$500m. 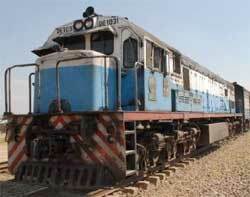 These exclusive rights were granted to Northwest Rail Company by the Zambian government in July 2006. An agreement signed this week will enable the parties to conclude a bankable feasibility study‚ which is currently under way. "I have been developing this project for a number of years and the synergies with Grindrod's rail businesses means we will be able to bring this project to being in the shortest possible time‚" said Enoch Kavindele‚ a former Zambian vice-president and founder and owner of Northwest Rail Company. The railway is to be built in two phases‚ with the first phase extending from Chingola to the Kansanshi‚ Lumwana and Kalumbila mines‚ and the second to connect with the Benguela line on the Zambia-Angola border near Jimbe. The first phase is intended to service existing ore and finished copper traffic. The second is intended to open up a direct corridor to Lobito‚ which would allow landlocked Zambia to import oil directly from Angola‚ and to stimulate further mining activity in the western copperbelt. Consultancy KPMG's infrastructure and major projects team have developed the project with Northwest Rail Company over the last year‚ and have facilitated closure of the deal. Subject to the conclusion of the phase one bankable feasibility study‚ construction is expected to start this year. Grindrod's rail division operates railways and builds‚ refurbishes and maintains locomotives and wagons. It also provides rail signalling systems and constructs and maintains track infrastructure. "We have spent the last few years developing our rail capabilities and growing our capacity to participate in the growth in the Africa rail sector‚" said James Holley‚ chief executive of Grindrod's rail division. Dave Rennie‚ chief executive of Grindrod's freight services unit for ports and rail‚ said the investment will enable Grindrod to complement existing investments in the regional north-south rail corridor and port operations in Maputo‚ Richards Bay and Durban. "We also see great potential in creating an Atlantic gateway to Central Africa through Lobito and look forward to playing our part in making this a reality with the development of phase two‚" he said.